A new imaging device at the Ziv Medical Center in Tzfat enables doctors to see the inner workings of the retina, at the back of the eye. A sophisticated new imaging device purchased by the <?xml:namespace prefix = st1 ns = "urn:schemas-microsoft-com:office:smarttags" />Ziv Medical Center in Tzfat enables doctors to see into the innermost areas of the eye without touching the tissue. 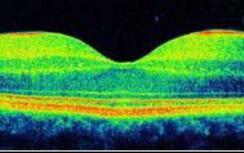 The OCT – short for Optical Coherence Tomography – is a non-invasive technology used for imaging the retina, the multi-layered sensory tissue that lines the back of the eye. Eye conditions such as macular degeneration, pre-retinal membranes, macular holes or swelling and optic nerve damage can all be visualized by the device. Similar to CT scans, the OCT provides a pixel representation of 10 anatomic layers of the retina that are differentiated and whose thickness can be measured through using an optical backscattering of light to scan the eye. The device, which cost the medical center $110,000, is considered the world’s most advanced method of detecting eye disease. The machine itself consists of a camera connected to a computer, which processes the data received from the eye. During the test, the patient stares at a blinking light, during which time the device sends a wave of light to the retina. The length of time it takes the wavelength to return from the eye to the computer is measured by the device, which also absorbs a digital painting of the retina and all its different layers. The elaborate processing ability of the OCT also enables diagnosis of pathological conditions that until this point were too difficult to pinpoint, explained Pikel. For instance, it helps secure an accurate quantitative diagnosis of glaucoma, which causes blindness, through measuring the thickness of the fibers that connect the optic nerve. The OCT can also measure the patient’s response to treatment for the same condition. The Department of Ophthalmology has been upgraded in recent years, according to Ziv Medical Center CEO Dr. Oscar Embon. At present, he said, the department possesses the best technological equipment in northern Israel for treatment in the field of laser eye surgery as well.